Are you days away from your wedding rehearsal? Perhaps your rehearsal is still weeks or months down the line. As a Non-Denominational Wedding Officiant/Minister who has led hundreds of rehearsals for couples in all types of settings (church, chapel, park, waterside, side of mountain), I have had the remarkable experience to be “up front and personal” at rehearsals of all shapes and sizes. As move toward your wedding rehearsal and rehearsal meal, I offer these suggestions for a fun, engaging and memorable wedding rehearsal. 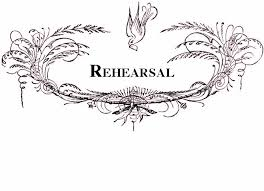 ~ Start On Time: If your rehearsal is scheduled for Noon, put 11:30 a.m. on all invitations and notices. Wedding party members and family/friends are notoriously late for rehearsal and this often creates chaos and stress as the bride and groom attempt to keep everything on “time” for the rehearsal dinner/meal. ~ Insure You Have a Strong “Rehearsal” Leader: Why? Because nobody – and I mean nobody – is really listening at a rehearsal. A wedding rehearsal, while an event, is an “emotional event,” which means that while people appear to be listening, they really are somewhere else. Do you have a wedding consultant or day or planner? Wonderful! Use him or her to take a strong leadership role in your rehearsal. If your Minister or Officiant is leading the rehearsal, insure that this person knows the mechanics, nuances and strategies to insure a successful rehearsal. Most of all, if the person leading your rehearsal directs with kindness and great humor, a wonderful memory will had by all attending this event. ~ Bring Your Marriage License To Rehearsal ~ Insure that you remember your marriage license by bringing it to rehearsal and giving it to your Minister/Officiant or Wedding Planner. You can’t be married without your marriage license and handing it off to a “person in charge” gives you one less thing to worry about! ~ Rehearsal “Buffer Day” ~ Couples who allow for a “buffer day” between rehearsal and wedding day often walk into their wedding day with more grace, elegance and ease. If your wedding is on a Saturday, rehearse on a Thursday and use Friday for a spa day, time with your Sweetheart and people or perhaps to attend to last minute planning details. Also, by having a low-key buffer day, you most probably will get better sleep than being up late into the night with a rehearsal and rehearsal meal and get-together.